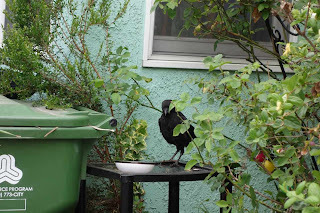 Archie's Garden: Russell Crow Visits Archie's Garden! Russell Crow Visits Archie's Garden! I thought this crow was sick. At first I was very worried. I came home and as I was about to open my front door, I saw this disheveled crow sitting near our stoop. He wouldn't fly away, just sidled away from me as I moved closer. Uh-oh, I thought...it's sick (and we have West Nile in our crow population here in Mar Vista.) I didn't know what to do, but I did know not to touch it. Baby crows have blue eyes. He sat there for several hours, moving very little. I took a few photos, and good thing I did. We tried keeping an eye on him and were worried that one of the local cats would get him. 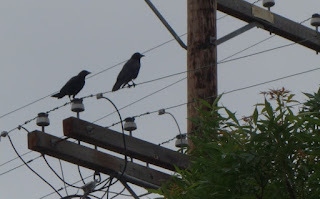 We started looking around for crow rescue societies. 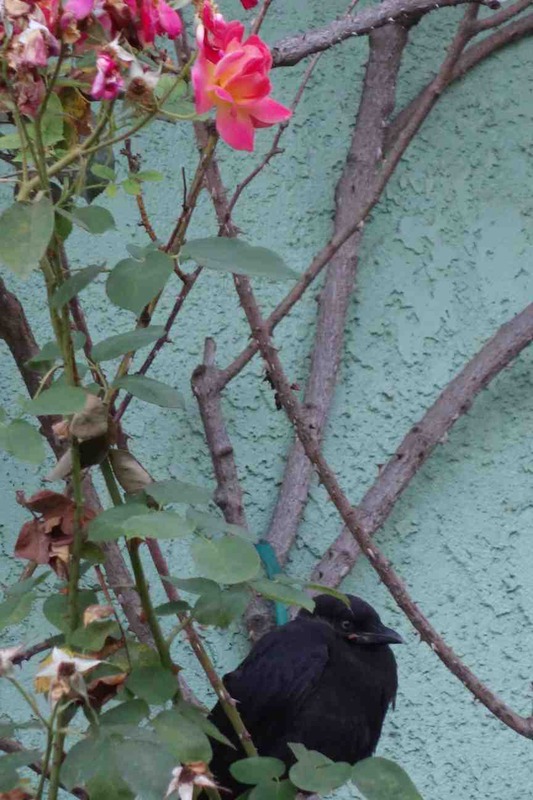 However, as nightfall approached he struggled to climb up into rose bush. I put out some water on a platform and he drank a little. 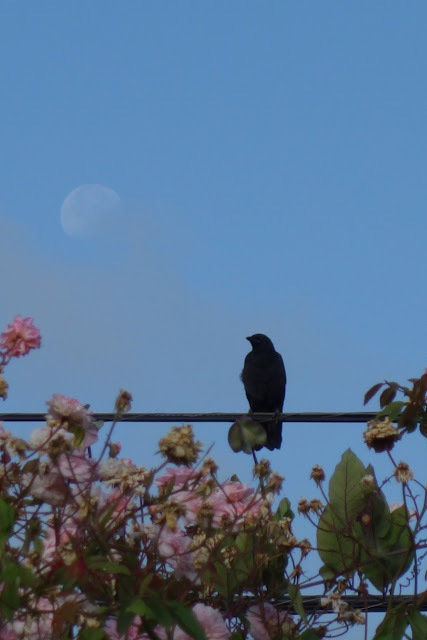 In the morning he was still in the rose bush. Russell climbed into the roses at night for safety. But then I found some websites that explained the whole thing. Little Russell, as we called him, wasn't sick. 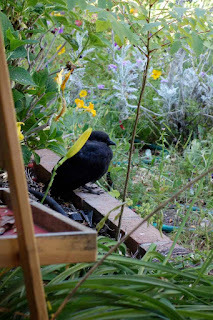 He was a baby crow--a fledgling--that had been pushed out of the nest. However, he hadn't been abandoned by his parents; in fact, his parents were nearby, waiting to feed him and keep him company. We identified that he was a baby from the photos I took--baby crows have blue eyes, and adult's eyes are brown. Sometimes crows push fledglings out of the nest before they can fully fly so they aren't sitting ducks (as it were) if the nest is attacked. Russell and one of his folks. 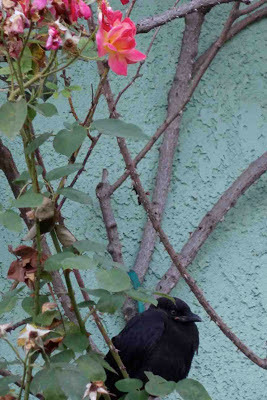 During the day Russell would hide in the thicket in our front yard, then climb up into the rose bushes at night. Sure enough, his parents would come feed him regularly. A few days later, we saw Russell fly--very clumsily--into the tree next door, with Mom/Dad close behind. The past few weeks he has been flying further and more smoothly, but he still hollers every morning and every evening for food. His cry isn't like a mature crow's squawk, it's like a very loud nasal duck. We're glad to know he's doing okay. We'll see you around the neighborhood, Russell! Russell contemplating his next flight plan. 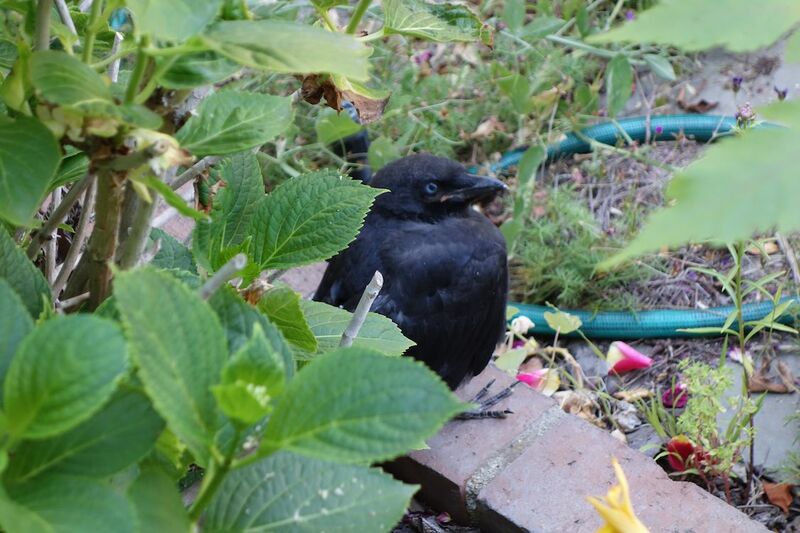 If you'd like to know what to do when you find a baby crow, check out these websites. Remember, don't touch! Crows are wild animals, and sometimes trying to help will do more harm than good. The photographer managed to take some really amazing pictures and it is really difficult to take such pictures. Thanks for such an amazing post. Keep it up.